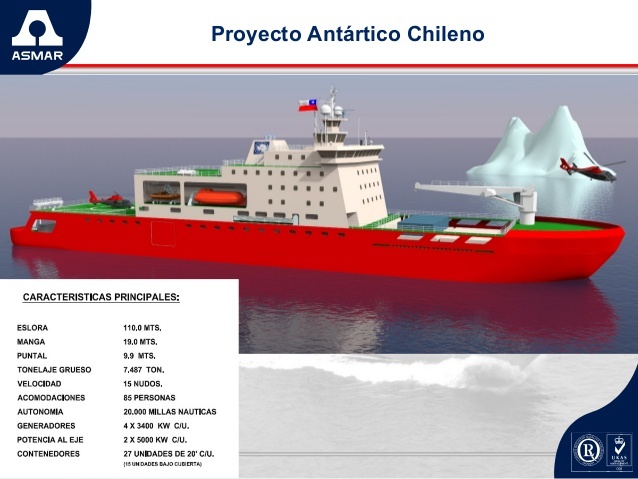 Photo: VARD designed icebreaking supply vessel for Chile. This is in response to a contracted awarded to five shipbuilders on Feb. 22, 2017, for preliminary design studies and analysis. Contracts were awarded to Bollinger Shipyards, LLC, Lockport, LA; Fincantieri Marine Group, LLC, Washington, DC; General Dynamics/National Steel and Shipbuilding Company, San Diego, CA; Huntington Ingalls, Inc., Pascagoula, MS; and VT Halter Marine, Inc., Pascagoula, MS, totalling approximately $20M. Fincantieri is building a 9000 ton research icebreaker for Norway and Vard has designed an icebreaking supply vessel for Chile. This is the first time I have seen Fincantieri associated with Philly Shipyard. I wonder if they are thinking about an acquisition. They seem to be on a buying spree. Fincantieri had Philly as a finalist for the location of their LCS work, and played footsie with Aker a few times I recall. Wouldn’t put an acquisition past them. If they get the polar icebreaker contract they might. That said, there is a big reason why the might be inclined to just partner. Fincantieri is one of the largest cruise ship makers in Europe. Philly has twin dry-docks 4/5 (333×47.5m) just slightly smaller than their single dry dock Monfalcone (350 x 56 m) and Marghera (334 x 54 m) yards in Italy. They buy Philly without a major military contract, take a guess what the press and their own shareholders are going to be incessantly asking them about? They sure aren’t going to be satisfied with the 600ft product tankers Aker is building there. They were expect a major cruise or naval capitol or large support ship contract. I could see them doing a buy including the Philly Navy yard though. Rhodes Industries owns the eastern part of the yards. Their facilities include the smaller dry-docks 2 & 3, fabrication and paint facilities, and the piers. They have the ability to build naval escorts and already have Navy clearance, security, and existing repair contracts. In other words, they’re like Marinette or Bay, but located east coast. It wouldn’t be hard to envision a scenario where Fincantieri buys Rhoads buys Eastern for the OPC contract and moves the construction. 25 units are a lot and let’s be honest, while Eastern has a great design, but there is no way their very basic Panama City Yard is going capable is putting these out at the rate the Coast Guard is going to need them.